The manufacturing industry has been a closely watched segment of the economy, especially in the wake of the recent improvement in general fiscal activity. A report released by the statistical department on Tuesday has brought to light some not-so-impressive data pertaining to the factory sector. Ending five months of consistent growth, factory orders retreated at the beginning of the year, owing mainly to softer demand for transportation and defense equipment. New orders dropped 1.4% sequentially to $492 billion, marking the first fall in six months and a sharp departure from December’s 2% growth. Both defense and transportation equipment orders registered double-digit declines. Technically, weak demand translates into inventory build-up, which is a good thing for the industry’s growth in the long term. Considering the exceptionally high demand witnessed in the latter part of last year, it is safe to assume that the January setback is nothing more than a transitory pause. Orders should bounce back as the year progresses and the positive effect of the recent tax cuts takes effect, ideally in the second and third quarters. Manufacturers would use a part of their tax-related gains to salvage sick units by investing in infrastructure and equipment. This, along with the fresh buoyancy brought about by easing of the trade war fears following the diplomatic intervention, is expected to enhance factory activity in the coming months. 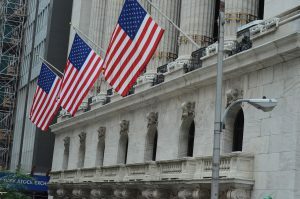 On Tuesday, the Dow made significant gains after tension over the tariff-induced trade standoff eased. The main contributors to the 336-point gain were Caterpillar and Boeing, whose core business is heavily reliant on steel.